We only chose locations that didn’t require an entry fee, so this is a good list of free things to do in Perth. Opposite Perth train station you’ll see Forrest Place. That’s where you’ll find ‘The Cactus’, the big green sculpture at the start of our video. Not far away is a water fountain which is especially fun when it’s hot. You’ll find London Court along Hay St Mall. It’s a gorgeous little arcade filled with interesting shops. Down on the water at Elizabeth Quay you’ll see all sorts of interesting sculptures and good places to sit. It’s also where you’ll find the beautiful carousel that features in the opening of our video. We only filmed one location in Northbridge. It’s where all the arty things are located – the gallery, the museum and the library. There are also a LOT of eating options in Northbridge. Kakulas Brothers is always on our list of shops to visit when we’re in Northbridge. It’s a bulk food store which stocks everything you can imagine, as well as a lot more. The smell that hits you when you walk in is intoxicating. Kings Park is one of the best things about the city of Perth. At 400 hectares, it’s one of the world’s biggest inner city parks. It includes beautiful manicured lawns and gardens as well as a large chunk of native bush. Kings Park is positioned high above the city and river, so you get sensational views from every angle. I recommend that everyone visiting Perth visits Kings Park. In fact, if you only have time to do one thing, this is the thing I’d recommend you do. Queens Gardens is (are?) located right next door to the WACA, in East Perth. It’s a lovely park for a relaxing stroll and it’s home to a very special Peter Pan statue. A fellow named Sir George Frampton made the original statue, which is in Kensington Gardens in London. I took photos of it a couple of years ago and didn’t realise there were others around the world, so I was really surprised to stumble upon the one in Perth during our filming. It turns out Sir George made 6 full size casts from the original moulds and they were put up all over the world between 1924 and 1929. The Perth Peter Pan statue went up in 1929. Sir George Frampton died in 1928 and a memorial in his honour was made by another sculptor. It’s in the crypt at St Paul’s Cathedral in London. It’s a naked toddler holding a little Peter Pan on an outstretched hand. We Australians don’t realise how lucky we are with our beautiful white sand beaches stretching for thousands of kilometres along the coast. It’s not until you travel to other parts of the world that you realise we could have drawn the short straw with pebbles or sand. Cottesloe Beach is stunningly beautiful, with snow white sand and sapphire blue water. It’s popular with the locals so it’s very busy on weekends in the summer. Every year Cottesloe Beach is host to ‘Sculptures by the Sea’. 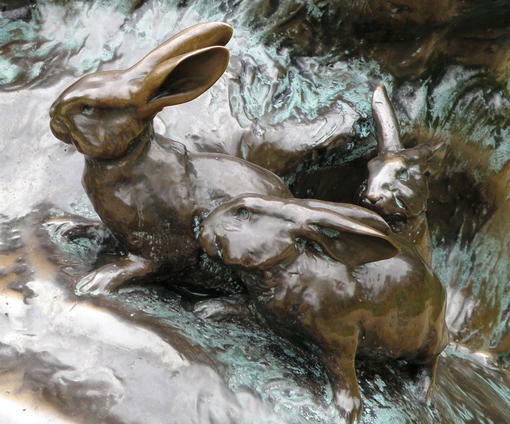 At any time of the year you can enjoy the many sculptures along Marine Parade. We featured 5 of them in our video. Australia is an ancient country, but the modern world as we know it only appeared quite recently. Many homes in Europe were built before the first Europeans arrived in Australia. Fremantle is one of our historical areas. It was part of the original settlement of the ‘Swan River Colony’ before we became known as the Colony of Western Australia. You’ll find some fabulous old buildings in Fremantle, as well as interesting museums and historical points. I should probably mention all the restaurants on the ‘cappucino strip’ of South Terrace too. We did a lot of filming in Fremantle because everywhere we turned there was something fabulous. We found the cute little striped huts, the ferris wheel, the amazing Rainbow Sea Container, an optical illusion artwork that covered an entire street, sculptures and more. We had a heap of fun dressing up at the WA Maritime Museum and fighting a duel to the death. I let Casey win because I’m the Mum. The inspiration for this video came from Abd Faiz, an Indonesian YouTuber. He published a video called ‘One Day in Bali’ where he walked through various scenes in Bali. I loved the simplicity of his video. Casey and I decided to do our own version for Perth, Western Australia. 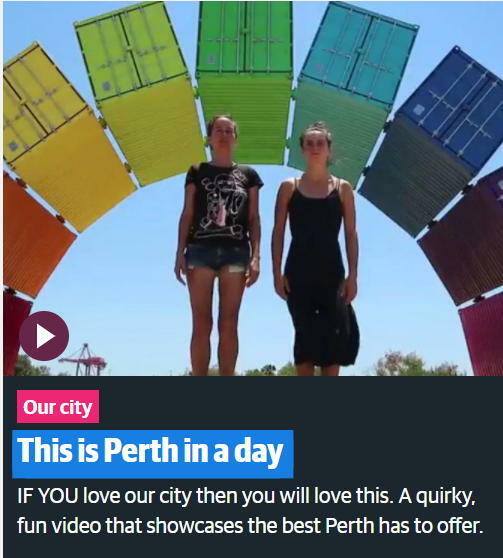 This video was featured on the home page of the Perth Now website. Absolutely wonderful, and i loved every second! But the highlight was finding out about Peter Pan. It was my daily toddlerhood walk in Kensington Gardens and I always try to make a little pilgrimage when I’m in London. Now I can go to see him in Perth too. I’m so excited! I am thoroughly thrilled about this. I was delighted when I found it and I can only imagine how much that would be amplified if it was something special from my childhood! Aren’t we lucky to live in such a wonderful place! Loved your perspectives thank you …….. did you know that the cannon at the Fremantle Round House is fired every day (except Good Friday and Christmas Day) at 1.00pm. Visitors can book in advance (08) 9336 6897 to act as the honorary gunner on the day or take a chance that it has not already been booked and approach a Guide on the day. It’s free too but a gold coin donation would be most welcome. Oh that sounds exciting! I can see I’ll have to make another video, in which I get to fire the cannon! Dressing up would clearly be required. 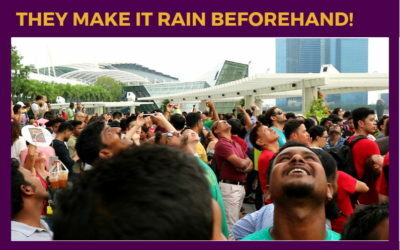 Dressing up not mandatory but you obviously have a great sense of fun – so why not! Thank you for doing this so beautifully – expressing all the good things about Perth. I watch it as an antidote to anxieties and world weariness some days! Thank you so much for your lovely comment Catherine, it makes me so happy. I also watch it for general happiness but I thought that was because it reminds me of a precious, fun filled day with my daughter. You have no idea how much you inspire me to make more happy videos!